Provide comfort for the family of Paul Nutting II with a meaningful gesture of sympathy. Paul Charles Nutting II, 44 of East Syracuse, loving son, brother and friend passed away suddenly on Tuesday of a heart attack. He was born in Syracuse and graduated from East Syracuse-Minoa High School in 1992. "Paulie" worked as a self-employed carpenter for over 25 years. Paulie loved his family and friends. He would often spend his days with his mom, fixing the homes of both his brothers and visiting with the Wayno family. His passions were wood working, love of animals, United States History (with a strong Republican sided view), military training, target shooting and watching reruns of his favorite tv shows such as Alf, The A-Team and old westerns staring John Wayne. One of his proudest moments was purchasing a small piece of property in North Carolina and building a home with his good friend. Paulie is survived by his mother, Pamela Taylor Nutting of East Syracuse; father Paul (Jan) Nutting of Norwich; two brothers, Christopher (Jennifer) Nutting of Phoenix, NY and Matthew (Stacey) Nutting of East Syracuse; niece Averie, numerous uncles, aunts and cousins; and his close friends Joe and Brenda Wayno who became his second family. Calling hours will be Sunday, February 3, from 1 to 4pm at the R.H. Schepp & Son Minoa Chapel, 6530 Schepps Corners Road, Minoa. Pam and Family...I am so sorry to hear about Paulie's untimely death. I have not see you all in years but will never forget when we were neighbors back in Minoa when we bought our first home. May Paulie rest in peace and that you ,Chris and Matt find peace in the memories you hold dear. So sorry to hear of Paul's passing...I have known him for years. I have bought and have sold many of his creations. Truly a unique individual with a large creative personality! God has a place for Paul as he will keep them hopping up there in heaven! Sending my thoughts and prayers to his family and to Joe and his family too. Our thoughts and prayers are with you and your entire family during this difficult time. G.M. 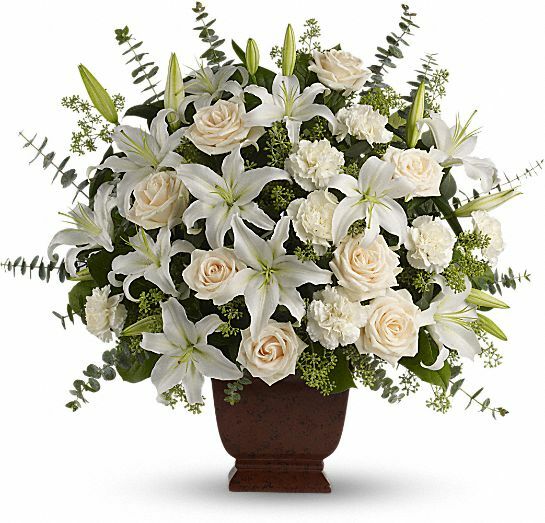 Crisalli & Associates, Inc. purchased the Loving Lilies & Roses Bouquet for the family of Paul Nutting II. My deepest sympathy to Paulie's family. The sudden loss of a loved one is difficult, especially when they are young. May all your wonderful memories bring a smile to your face and peace to your heart. God be with you all.